Ad Sizes And Formats For 2012 | AdsWiki - Ad Network Listing, Reviews, Payment Proof & Advertising News. Following the trends of the last few years, ad sizes and formats are getting bigger and bigger in an attempt by advertisers to better grab people’s attention and redress the increasing problem of “banner blindness”. The IAB continues to focus on the leaderboard, wide skyscraper, medium rectangle, and rectangle sizes, in their Universal Ad Package – meaning that we will see more and more advertisers wanting these sizes and ad networks offering them to publishers. 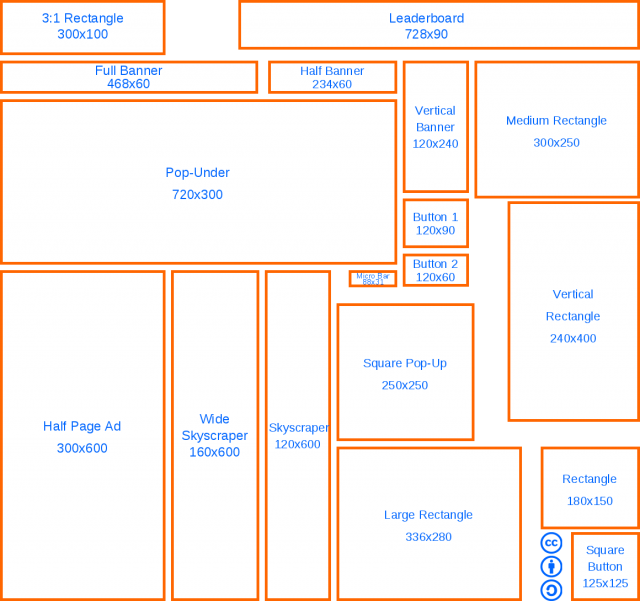 Below we’re got a graphic outlining the different shapes and sizes of the various official advert types around at the moment, and the table beneath sets out the aspect ratio of each one, as well as linking to lists of ad networks offering that size. Sizes in bold are part of the IAB’s Universal Ad Package. One Response to "Ad Sizes And Formats For 2012"